I was listening to “Sign of the Southern Cross,” from the album Mob Rules, and it reminded me of the long-time paradox I’ve contemplated about it. Let’s call it the Iommi Paradox. “Sign Of The Southern Cross” has this huge, epic riff. It’s like many of Tony’s riffs. Everyone talks about his riffs, but I’m wondering if very many people see the real magic. For me, this riff embodies that magic, which I am calling the Iommi Paradox. Let’s define the term. 3. Somehow, this simple riff is completely original, memorable, and chilling. HOW DOES HE DO THIS? Mob Rules was their 10th studio album. Any fan can go back through the first nine albums and make a list of these riffs, album after album, riffs like Iron Man, Sabbath Bloody Sabbath, and Heaven and Hell. So, he’d been composing these riffs for at least 11 years when “Sign Of The Southern Cross” came out. There was an explosion of metal albums in the early 80s, and metal was about 11 years old. Iommi himself had written numerous complex riffs and bridges and solos by 1981. I did nothing but work and listen to metal in 1981. You would think that either he’d have run out or that someone else would have found this one, and I would have surely heard it. But I recall with perfect clarity how overwhelmed I felt when I heard “Sign Of The Southern Cross”. It was magic, and I knew immediately that only Tony could have done it. I submit that the Iommi Paradox is only partly musical. 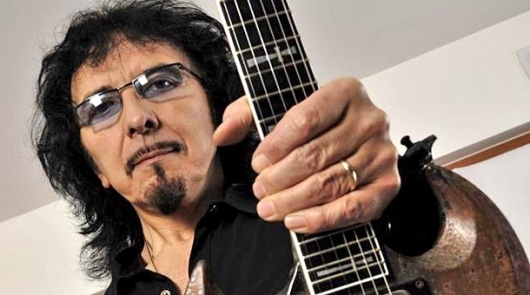 I’ve said it before: Tony Iommi is not just a player, and perhaps not just a composer. He finds riffs and structures that are so wired into us that we respond to them as if they have always been there. And maybe they have. We say he writes them, but I think he discovers them. They are too perfect, too primordial, to be the work of human hands. Maybe his injured human hands had to look elsewhere. Rather than default to speed and flash like many of the guitarists did then, Tony reached out to the universe and moved its beauty and grandeur onto his fretboard in a kind of novel familiarity that-in another paradoxical moment-warms our hearts with chilled blood. Maybe these “simple” riffs didn’t exist before because no one was looking for them. I know it may sound a little odd, but Tony’s gift is one of awareness. He finds the terrible beauty of the cosmos and gives it to us in a handful of power chords. And somehow, we know that it’s way beyond the notes and patterns. It’s a basic human response, perhaps because we are also of the universe. Maybe it’s like the Fibonacci Sequence: a pattern so consistent that it’s not accidental. There’s an analysis for someone. I wonder if you could plot these riffs that way.